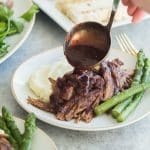 This Instant Pot Roast Beef is fall apart tender and has the best sweet and savory gravy! It's an easy pressure cooker roast beef recipe that is perfect for any night of the week! In a small bowl, combine seasoning salt, garlic powder, Italian seasoning, onion powder and pepper. Rub over roast. Turn the Instant Pot to saute and add the oil. Sear the roast on all sides until golden brown and releases from the pan easily. *You can skip this step, but it does help to keep the juices in the meat and adds flavor. Add beef broth to Instant Pot and scrape the bottom of the pan if there are any bits stuck on -- this prevents the burn method from appearing. Close the lid, turn the valve to sealing and select Manual or Pressure Cook for 80-90 minutes (depending on the size of your roast. If you cut it into two or three pieces, you can reduce the time slightly). The Instant Pot will take about 10 minutes to build pressure and begin counting down. After the cook time is up, allow the pressure to release naturally for 10 minutes. Open the lid, remove the roast to a cutting board and let rest. Drain all juices from the Instant Pot except for 1 1/2 cups. Add cranberry sauce, sugar, garlic and red chili flakes for a bit of spice if desired. Turn to saute and cook and whisk until bubbly and combined. Adjust salt and pepper to taste. Shred or pull beef and serve with cranberry gravy.